Ken here with Imagination Station Kids On Track Model Railroad And Train Safety Program, E. Helena, Montana. For all you folks out there that know Barry Olsen, I just want to inform you that I was notified that Barry is currently in the hospital and needs your help financially. As you may be aware of, Barry has enriched the lives of millions of children and the public across the West Coast and Northwest areas of the United States by donating locomotives, rolling stock and parts to our program over the years. Barry has not only helped us out over the years but he has been instrumental in providing redesign of Bachman locomotive drives for the large-scale hobby. 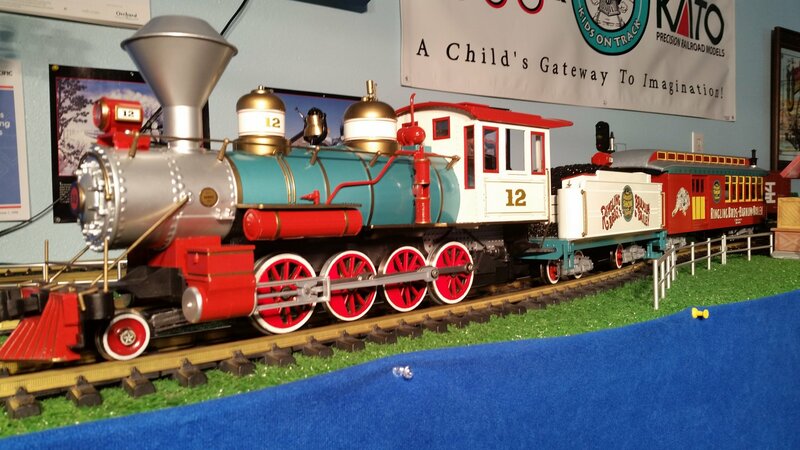 Barry recently rebuilt a drive for our Disneyland railroad locomotive, which, incidentally, is an LGB. This locomotive is the only LGB locomotive to ever be fitted with a Barry's Big Trains drive. You can see this locomotive in operation on the video below and in posts here on this site, under our name. Many of you out there own one of Barry's locomotives and fully understand the fantastic design and pulling capabilities of Barry's equipment. I consider Barry to be my best friend but since this happened rather quickly, within a day or two, his phone goes to voicemail immediately, so I don't know much more at this time. I will have to post additional information as soon as i can get it, here on this post. I am not exactly sure on his condition yet but it must be serious because his daughter Liz posted a comment on our You Tube video channel and has set up a Go-Fund -Me page, which you can read below. Check out our other videos with Barry's locomotives or add your You Tube videos/photos of Barry's equipment to this post. Here is the You Tube video. Please read the comments at the bottom of the page. Many thanks to Barry for all he has done for our program, Imagination Station Kids On Track and his wonderful contributions to the large-scale train hobby. GET WELL SOON BARRY! From all of us at Imagination Station Kids On Track, all the kids and families who have enjoyed running your locomotives/trains over the years, as well as all of us large scale hobbyists!! THANK YOU! Was able to speak to Barry briefly. Barry's condition is serious. He is very weak with a serious ulcer and aortic anurism. Hi, Im Liz Harris ( Olsen) , I thought I would give all of you an update. They were able to get a look at the ulcer, its not bleeding or torn, so thats good. Now for the bad part, he isnt strong enough for the surgery, so they are trying to get him to a rehab to get him stronger. In the meantime, we are just hoping and praying it doesnt burst. I am trying to make it there, but times are hard here in Rockport, Tx, where hurricane Harvey has left our home and town still trying to recover as well. Thank you for your kind words of my dad, he is pretty awesome! Thanks Liz for the update. Please post thIs on lagescalecentral.com if you wouldn't mind because there is a similar post there, if you haven't already. You're right, he is an awesome guy! Wishing him well, from all of us. Barry's condition at this time is very serious. I have spoken to him and even though he is a big groggy, he extends his gratitude to everyone for their kind thoughts, words of encouragement and prayers. He has 2 stress tests to pass tomorrow, (12/24/18) as he calls it, to determine whether his body has the stength to endure surgery. All we can do now is wait and hope for the best. Surgery is crucial & mandatory, if he can pass these 2 tests. All updates are given upon Barry's request and permission. Family will be visiting on the 26th when he is physically able. Will continue to update as information is available. Barry did NOT pass the stress tests and therefore surgery is not an option in his condition. We don't know if he will be able to go home but at this point he is weak and it's highly unlikely. Family is on the way to visit because we're not sure how long he may have. If however he pulls through, he probably will be in an assisted care facility permanently. He has 3 total optons which none are good. All information updated today by phone, per Liz, Barry's daughter. Come on, Folks!!! This is no time to be parochial, especially about somebody like Barry who has given so much to the world of big trains over many years. Put your hands on your plastic, and donate. It's Christmas, right? tac, Mrs tac, ig and the crows. I'm on vacation in another state, just saw the gofundme site.... good going guys! keep it coming.... I was worried for a bit, but really nice to see progress... I see I could have done an anonymous donation too, missed that. Barry was transferred to a therapy/hospice facility where had a fall on his first day today. He hit his head and ended up back in the hospital E.R. CT scans determined there were no major injuries from the fall and he is back at that facility. He would like to return home, however it has been determined that he can no longer live alone and needs 24 hour professional nursing care. At this time it does not appear that he will be capable of building drives or repairing locomotives or rolling stock any longer. All of the projects at his residence are currently being returned to their previous owners by his family. If you have a locomotive or rolling stock that he was working on, please private message me and I will contact the family and work out a return or with their permission, get you in contact with them directly, especially if you have more than one item. Please be aware that due to limited finances that the family has to work with, all items have to be returned COD. Apilogies but all items will be returned in the uncompleted condition or state of repair they were in when Barry entered the hospital originally. A sincere thank you for everyone's concern. As unfortunate as all this is, we wish and hope for the best for Barry in the future and we hope to have him with us for a long time to come. If anything else develops, we'll sure let all of you know. Barry says Hi to all of you! Thank you, Large Scale Central and everyone on this site for your patience and understanding and for allowing us to post this information. You have some great folks here! All update permissions granted by Barry and Liz. Just an update on Barry's condition for the large-scale community. Barry's dementia has excellerated to the point of not knowing some folks, among other things. He is now in a permanent nursing facility and is being cared for 24 hours a day. His health has deteriorated buy another 15% or so and there is no way that he will be able to return home or be capable of working on trains any longer as mentioned before. 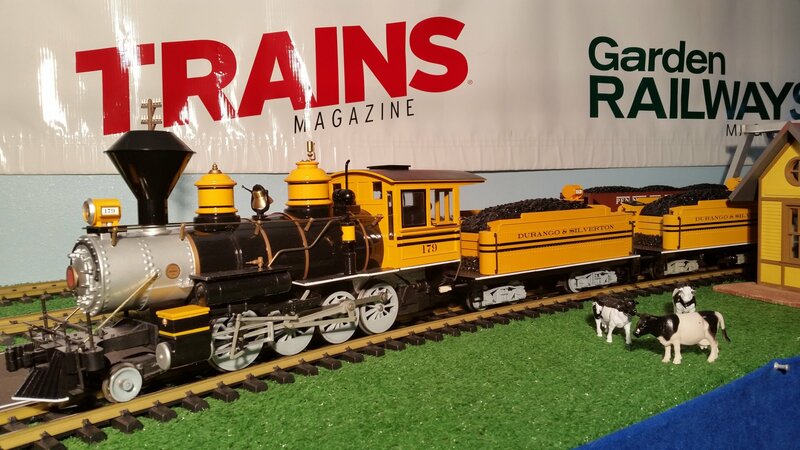 I wish to apologize to the folks who i contacted who run G scale Central because for some reason I either lost this post in the woodwork somewhere and was unable to post anything further because I couldn't find it, or it returned here somehow. Either way, I wish to thank you guys for allowing us to post this information about Barry. I posted an update (above) from a few days back that I didn't get posted here due to the above issue. So that one is a few days late. Our apologies. Thanks to everyone for their love and support. All the best to all of you and Happy New Year! All our thoughts are with Barry and his family in these hard times. It's a time to remember all the good things - the positive things - of which there are a great many. Mrs tac and I join the rest of the large-scale model railroad community, to which Barry has made such a great series of contributions over many years, in wishing him well, and extending our good wishes to all the families around him. tac, Mrs tac and famb. Thank you for all your best wishes for Barry, we really appreciate it and I will call Barry today and give him your name and let him know. He may not recognize it due to dementia but we have had a large number of well-wishers and we want him to know about each and every one of them. I will read what you wrote to him personally. Despite what the doctors have said, we all want him to recover and we appreciate folks like you who care. Thank you and all the best to you and your family! Ken, he might just have a memory of me from the large-scale section of the Bachmann Trains forum, where I used to write when I had anything Bachmann-y to write about. Barry is still in the therapy/hospice facility in Phoenix and he actually remembered me on the last phone call. His nurse said he has been doing well lately but had no idea about the length of time that he would be there, or if he would ever be able to leave. It was sure nice to briefly speak to him with a positive outlook. His spirits seemed up and it was sure nice to see that. I wanted to take a moment to thank everyone for the love,support and understanding for my father. He loves his hobby and the people he had here, as well as the folks surrounding him. He is now living in Glendale in a assisted living home, it's a small home setting of 10 per house, and he seems comfortable there, and he is being well taken care for. As for his trains, I have them all. And aside from the folks that I have addresses for that I will be returning, I'm going to need some time, between work, my dad, and the rest of my family, it's very trying. 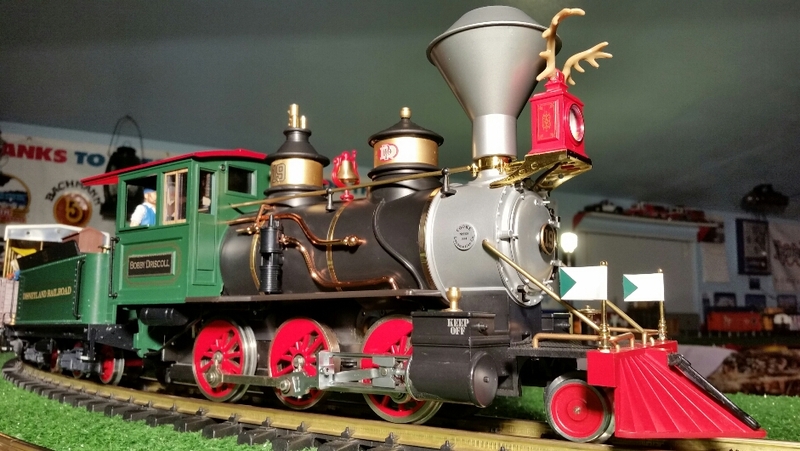 I will be posting pics of the trains I have for sale, and there's a bunch! I have pieces and parts of trains, which I be selling. I'm glad he is ok ... thanks for the update Liz. Liz - Just want you to know that over here your dad and you, and all the Olsen family, are in our thoughts. tac & Mrs tac and famb. Greg, please read your emails.